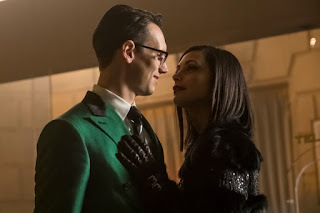 This week’s Gotham seemed like a bridge episode between the craziness of the recent Valeska family drama and the destruction that Joker will bring to Gotham in the coming weeks. We all needed to catch our collective breathes after what happened last week so it’s okay that this episode wasn’t as crazy as the last few (although there was essentially a zombie sighting!). Let’s get to it. This week’s episode starts with Barbara staring at the portrait of herself and Ra’s. A group of inconsiderate ninjas ambush her and she does manage to hold her own for a bit before they end up being too much for her to handle. The ninjas were actually members of the league of shadows trying to see if Barbara has fully accessed the powers of the Demon’s Head. Apparently the Demon’s Head can see the future and intense emotions are the catalyst to trigger this power. Barbara buys into this theory and tells them to step up the intensity next time. Tabitha has asked Selina to bring Bruce and meet her to discuss the situation with Barbara. Tabitha walks the two of them into a church where they get ambushed by the members of the league who have remained loyal to Ra’s. In the middle of the room is Ra’s decomposing body and the men force Bruce to go to it. They cut Bruce’s hand and pour his blood onto Ra’s body which reciting an incantation – bringing him back from the dead, in peak physical zombie form. Needless to say, Ra’s is not pleased about being woken from his planned slumber. The men beg him to reconsider his appointment of Barbara as his heir, claiming she will bring an end to the league. It turns out that Barbara must give the Demon’s Head back to Ra’s, he doesn’t automatically get it – however Ra’s isn’t too worried about that...he’ll just kill her and take it back if she refuses. Ra’s goes to visit Barbara and asks her what she has done in his absence. Barbara is focused on using the power of the Demon’s Head to rule Gotham like a queen. Ra’s does not take too kindly to this plan and demands that Barbara gives the power back, which she refuses. This leads to a fight, but the members of the league who are loyal to Barbara attack Ra’s as Barbara escapes the room. Outside Bruce, Tabitha, and Selina pull up in Bruce’s car and drive Barbara to Wayne Manor. They realize that Ra’s must be killed again, which will require the dagger. Unfortunately, after killing Ra’s the first time, Bruce and Alfred had donated the dagger back to the Nanda Parbat embassy. Alfred and Tabitha go to the embassy to try and get the dagger back. Alfred simply tries to ask for it back, but his request is promptly denied. That is all part of the plan and Alfred turns on the theatrics, pretending to have a heart attack to distract the embassy security and employees. During this diversion Selina repels down from the ceiling and steals the dagger. Selina, Tabitha, and Alfred meet up with Bruce and Barbara who both demand that Selina give them the dagger. It seems like both of them really want to kill Ra’s. Selina is clearly torn between her mancrush and her loyalty to her crime trio. Barbara decides to make the decision easier for Selina and points a gun at Alfred. Selina gives the knife to Barbara and the crime trio drive back to Club Siren. The female members of the league who are still loyal to Barbara meet them there. Barbara lays out her plan: use her glowing hand to summon Ra’s and then stab him. Selina has major doubts about this clearly super sophisticated approach and refuses to sign up for a suicide mission. Selina goes back to Wayne Manor and tells Bruce that she only gave Barbara the knife to try and spare Bruce from having to kill Ra’s again. While Selina is trying to get back in Bruce’s good graces, Ra’s and his men go to Club Siren. Barbara agrees to give Ra’s what he wants if he admits that they had a connection. She uses this moment to get close to Ra’s and stab him with the dagger, which does not kill him. Ra’s and Barbara get into a brawl and Ra’s ends up knocking Barbara down. He grabs her hand and begins stealing the Demon’s Head power back. At this very opportune moment Bruce runs out of nowhere and punches Ra’s, which stops him from continuing to recoup the power from Barbara. Ra’s picks up the dagger and stabs Barbara…or so we think. Barbara’s hand begins glowing and we see that the stabbing is actually a vision of the future that Barbara has seen. Barbara now knows Ra’s every move before he makes it and manages to counter all of his blows, getting the upper hand in the fight. Ra’s realizes this and in desperation grabs Tabitha and puts a knife to her throat. Ra’s demands that Barbara gives him the Demon’s Head or he will kill Tabitha. Barbara can’t bring herself to give up the power and Ra’s kills Tabitha in front of her. Once again we see that this is a vision of the future and instead, Barbara allows Ra’s to take the Demon’s Head from her. Absorbing this power causes Ra’s to become dezombified. Bruce demands the knife from Ra’s so he can kill him again, but Ra’s refuses and breaks the knife in half before disappearing. Later that night the women from the league go to Barbara and tell her that she is worthy to lead them and they reaffirm their allegiance to her. Back at Wayne Manor, Bruce is with Selina trying to plan how he can kill Ra’s. Selina tells him he needs to take a night off and they lean in to kiss. Ra’s appears and rudely interrupts the moment. He tells Bruce that he respects who he will become. Ra’s came to give Bruce an explanation as to why he chose to live. Ra’s tells Bruce that he saw a vision of a cataclysmic event that will plague Gotham. It will be a cleansing fire that will be used by Ra’s to forge Bruce into the Dark Knight of Gotham. We see Ra’s turn away from Bruce with visions of Gotham in flames in his eyes. Well…Ra’s is back. I knew that Barbara being the head of the League of Shadows wasn’t sustainable. The power to see the future is a neat little trick and it was pretty cool to see the power of the Demon’s Head in action. Ra’s vision of Gotham’s future was interesting and matches up with Jerome’s words to Jeremiah – to make them all burn. Anything to speed up the process of Bruce becoming the Dark Knight is good for me, so if this storyline will help move that along – all the power to it! While all of the craziness is going on with Ra’s and the league, Lee and Riddler are moving their plan along. When we last saw Lee and Riddler, she challenged him to break his record of robbing 3 banks in one evening. At the GCPD, Jim and Harvey are discussing robbers who robbed 5 banks in one night - turns out Riddler and Lee crushed that record. Jim and Harvey feel like the person who robbed all of the banks did it to prove how smart they were – which leads Riddler to becoming their primary suspect. In the narrows everyone is buzzing about all of the money that Lee and Riddler have brought in. Lee distributes the money to the people of the narrows – sort of like a dark and twisted Robin Hood. Riddler questions what their relationship is, but Lee manages to avoid answering the question. Riddler and Lee are planning to continue the bank robbing fun the next night. Penguin and Butch happen to have chosen this moment to visit the two of them and overhear the plans. Lee is not jumping for joy at the idea of splitting the money with Penguin and Butch. Penguin can see that Lee is using Riddler’s feelings for her to her advantage and warns Riddler to be careful. Jim goes to visit Lee and asks about Riddler. He tries to convince Lee to give him up, but as the conversation progresses he begins to suspect that Lee may have had a larger role in the robberies than he initially thought. We see Riddler in the back room being tormented by visions of Ed mocking him, just like he did to Ed. Riddler goes to visit Penguin and tell him that he knows that Lee is using him. He wants Penguin to help him get rid of Ed’s personality. In exchange, he will split the score from that night’s robberies with Penguin – which should be about 100 million each. Jim and Harvey are desperately trying to find out where Lee and Riddler’s next robbery will take place. They question an executive from the Gotham bank branch that has been targeted by the robbers. She lets them know that the money from all the branches has been transported to one secure location. Riddler and Lee are already at this location and quickly take care of the guards. Riddler however has ulterior plans with Penguin and Grundy and he betrays Lee. In the vault, the Riddler accuses Lee of taking advantage of him which she denies. Riddler tells Penguin to take the money but leave the property deeds to the narrows because they are worthless. Butch and Penguin go into the vault to take care of his request. While the two of them are preoccupied, Riddler makes a Molotov cocktail and throws it in the vault with them – causing them to be trapped in the vault. Riddler warns Penguin to not come after Lee again and the two of them head upstairs. Lee asks Riddler why he did what he did and Riddler lets Lee know that the virus she had has awoken something within her that he loves. He forecasts that one day she will love him back the way he loves her. Jim arrives and Lee tells Ed to take the money to the narrows while she takes care of Jim. Lee walks outside and Jim immediately arrests her. It is still unclear about the relationship that Lee and Riddler have. I believe Lee is internally conflicted which is not helping provide any clarity for her in her other relationships. Jim is clearly going through a hard time dealing with the criminal version of Lee. He’ll have to get used to it sooner rather than later, because it doesn’t look like she is going to become a law abiding citizen any time soon. There are only 3 episodes left of this crazy season of Gotham. I know these next few episodes are going to be crazy, but I am sure as hell sad to know that the season is winding down. Next episode it is looking like Bruce and Jeremiah will have a reunion, of course Jeremiah is now a victim of Jerome’s special batch of laughing gas. At the very end of the preview for next week it looks like Jim is being held at gunpoint by…Harley Quinn!!! This is getting real folks!